The wealth created by the 19th century industrial society lead to a widespread market for the ‘grand’ country house. Owners, anxious to impress, encouraged their architects to produce exuberant and often vulgar designs based on a myriad of styles, over-ornamented French Renaissance, Venetian and Gothic predominating. There were some who reacted against the prevailing trend. William Morris and architect Philip Webb looked back to an age before the machine and founded the ‘Arts & Crafts’ movement. Progressive architects formed an alternative approach to design and Norman Shaw was one of the leading exponents. He created Bedford Park, an arcadian suburb in West London, and many successful country houses in the new style, of which ‘Cragside’ for the rich armament manufacturer A W Armstrong is the apogee. A young Scottish architect, Robert Weir Schultz, worked in Norman Shaw’s office with another talented man, Letheby. They joined forces to win the competition for Khartoum Cathedral, before Letheby was appointed Principal of the Central School of Arts & Crafts in Bloomsbury. Robert Weir Schultz moved to Scotland where he produced some progressive designs for the Earl of Bute. He broke away from the conventional ‘block’ plan and experimented with new plan forms intended to maximise the amount of sunlight and improve the prospect by spreading the building wings in the form of a butterfly. Examples from the great Edwardian architects, Charles Rennie Macintosh, Edwin Lutyens and Charles Voisey became a major influence in domestic design. 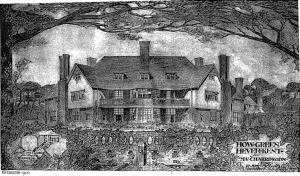 Macintosh had made sketches in Hever and Chiddingstone during a bicycle tour in the 1890s, noting particularly the Dower House at Chiddingstone (now demolished). The tradition of Kentish oak mullioned and leaded windows, tile hanging and elaborate roofs was assimilated into the ‘Arts & Crafts’ style producing a series of country houses admired by discerning patrons. The houses, mostly built in the Edwardian period, were known as ‘Butterfly’ houses. Mowbray Charrington, of the brewing family, commissioned Weir Schultz to design a small country house for his family on the site of an existing farmhouse at How Green. It was completed in 1905, at a cost of £5,000. A typical terraced house at that time would have cost about £100. The plan was of the ‘Butterfly’ principle, the wings being angled to take full advantage of the view over the Eden Valley, and perfectly orientated to enjoy the maximum sunlight. The design was shown at the Royal Academy in the summer of 1903, and published in The Builder. The house forms a crescent on the north side, dominated by three equal gables, but the scale is reduced by lowering the roofs over the servants and kitchen areas. The oak-panelled entrance hail with its fine tile and brick fireplace gave access to the Sitting Room, Dining Room, Library and Billiard Room. A generous oak staircase ends in an arcaded gallery, originally leading to seven bedrooms. A secondary staircase led to the second floor servants’ quarters. The garden, set in 33 acres of woodland, orchards and paddocks was carefully landscaped, the terrace being enclosed by a balustraded wall and a box hedge taking account of a fine three hundred year old oak tree. The surrounding garden falls away into a tree- and rhododendron-bounded natural area, including two ponds. In 1960 the house became the target for developers who intended to demolish it and build as many of the ubiquitous ‘Executive’ dwellings as the site would allow. However, planning consent was refused, and Douglas Higgs, who had just successfully restored Brocas Manor, stepped in and rescued the main house. With a sympathetic ‘feel’ for the house, Douglas converted the interior into four independent dwellings, retaining much of the original internal construction and leaving the exterior virtually as it was when first built in 1905.